The first jobs report under President Donald Trump showed the economy added 227,000 jobs in January, the Labor Department reported on Friday, up from December’s 157,000 jobs. The unemployment rate rose slightly to 4.8 percent this month. Market reactions to the news saw stock market futures move higher while government bond yields fell. In January, employment increased in retail trade, construction, and financial activities. Construction gained 36,000, financial activities were up 32,000 and professional and technical services saw a 23,000 gain. The change in total nonfarm payroll employment for November was revised down from 204,000 to 164,000, and December was revised up from 156,000 to 157,000. 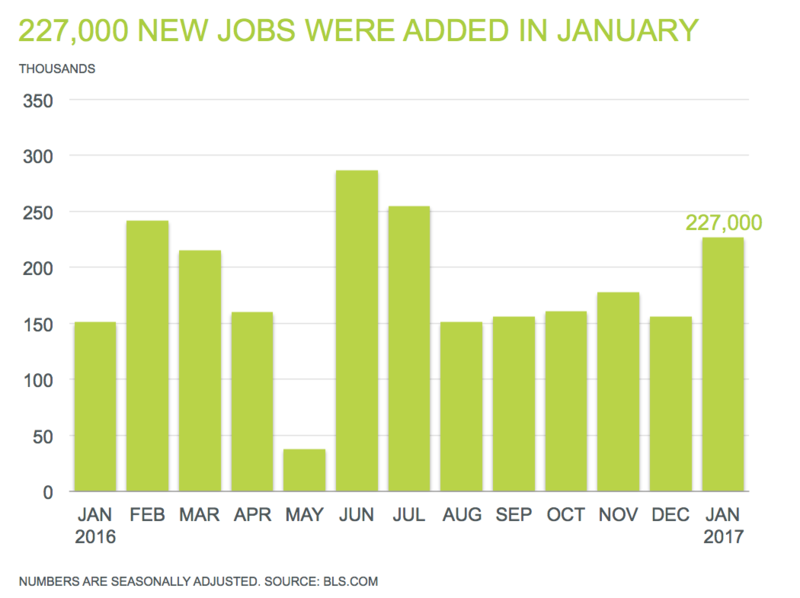 With these revisions, employment gains in November and December combined were 39,000 lower than previously reported. Over the past 3 months, job gains have averaged 183,000 per month. As 2017 kicks off, and a new presidency begins, all eyes are on the jobless rate and the wage growth. While the unemployment rate, at 4.8 percent, and the number of unemployed 7.6 million, changed little in January, most economists consider this surge of 227,000 jobs to be an indicator of an increasingly healthy labor market. President Trump, who ordered an across-the-board hiring freeze for the federal government last week, has pledged on the White House website to create 25 million new jobs. Economists predicted 175,000 additions ahead of this morning’s jobs report and the report exceeded expectations with 227,000 jobs added. Let’s break down the numbers from this month’s report. In January, hourly wages increased by $0.03 to $26 per hour, following a 6 cent decrease in December. This brings the year-over-year wage percentage increase to 2.5 percent. The unemployment rate saw a slight uptick to 4.8 percent. The market remains hot for job seekers looking for top HR, non-clinical healthcare and supply chain and logistics positions; therefore employers will need to stay competitive. 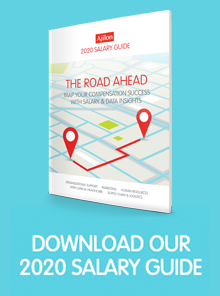 Make sure you’re paying your people the right salary and doing everything you can to recruit and retain the best talent – check out our 2017 Salary Guide. Do You Need a Supply Chain Certification?